We are very deliberate in identifying what your challenge or pain is, in order to design an appropriate solution. 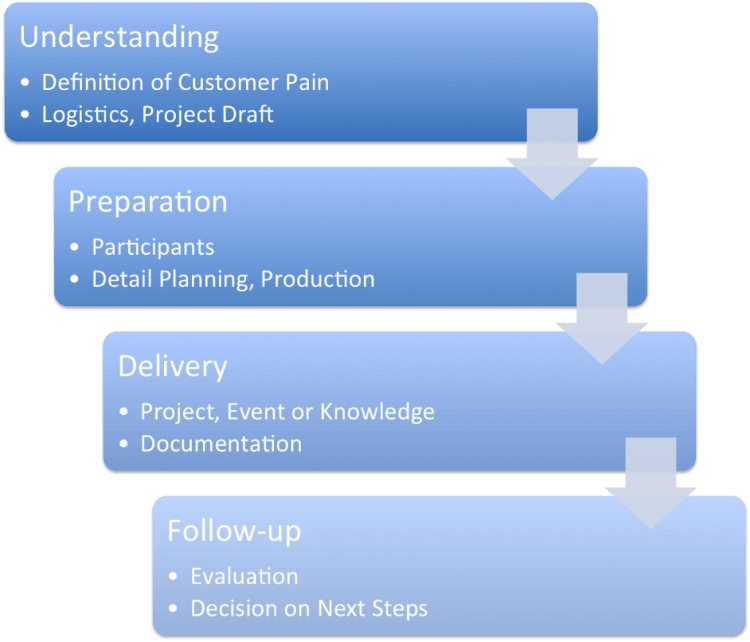 Once we have a validated description of your pain, we make an initial draft of the project, in terms of timeline, resources, activities, budget etc. The draft project plan and process plan is fed back to you, to make sure that we have a mutually agreed starting point. This involves briefing the participants and other stakeholders, e.g. with an initial survey, interviews or other information gathering. Detailed planning of project activities, and production of project materials. Depending on whether it is an Innovation Project, an Innovation Event, or Innovation Knowledge, or a combination of these, the delivery will span over a couple of hours to more than 6 months. We document ideas, plans or other output from you, and feed it back to you in an easy-to-read format, enabling you to decide on the necessary follow-up activities. We conduct an evaluation, through surveys, interviews, or a meeting with the major decision makers in the project. We decide if any further steps need to be taken, in order to further anchor the results.